Well it would seem Ellis Short’s Plan A to asset strip, lean down and sell on, in order to recoup the majority of his investment, is a non-starter. Was it ever a starter? Certainly not at £90 million. Now to Plan B. Get the club stabilised and then promoted (in order to carry out plan A). An appointment of Simon Grayson would seem a logical first step. I hear the doubters among you already. “what’s he ever done?”, “we’re bigger than him”, “we deserve better”. Well here’s the painful truth. He’s the only candidate we can afford. He’s the only candidate left with Championship experience, on a budget. He’s the only current manager who wants the job. All we as fans can do is get behind whoever is appointed 100 per cent, and support our club. 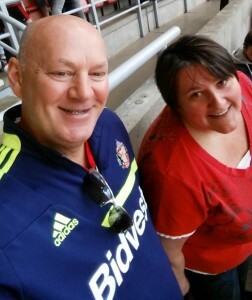 As talks on selling Sunderland collapse, are things at last looking rosier? Decent manager at this level, pls remember at all his clubs he has had to work to tight budgets. As for the article this is a very honest assessment of where the club is. Grayson seems a decent choice to me. He has a good record of improving teams on a limited budget, which is what I suspect he will find at Sunderland. I would rather see him use the youth system, and pick up decent young [ or experienced ] British players, than buy expensive, and frequently, useless ” names ” as has been the case in the past. Roy Keane used this strategy in his first season and achieved promotion to the PL at first attempt. Unfortunately, he then reverted to paying over the odds for so-called better players, and it was downhill all the way from there. Good luck Simon. You have a tough job, but could become a hero. … and it makes us less likely to be relegated a 2nd time. My biggest fear , dropping through the divisions like grain through a goose . A season of mid table stability at least under Grayson , I’m quite pleased he’s got the job on reflection. Totally agree with above articles comments, we are at the ‘beggars can’t be choosers’ ‘last saloon’ etc analogies. But….I still have nagging doubts about E.Shorts motivations, it all seems all and good that he would not sell the Club on to be put in a worst position (ironically enough it was Ellis who got us here in the first place) and he obviously want’s to maximise his investment, but this has to mean a slight, or more appropriately, seismic shift in his approach to running the Club and particularly with regards to transfer funds. Without transfer funds we are going no where this season, or at least no where with a positive connotation to it. The manager has to be given complete freedom and some sort of kitty to decide on who is to stay in the current squad, and on last seasons performances that would not be many, and new acquisitions. The new manager has to have the freedom to not only make the decisions to allow the club to stablise, but also put in the foundations for the push on promotion and ensuring that we have the basis to survive . Can all this be achieved in one season we will have to wait and see, is it even desirable to go straight back up, not without the above being in place. Of course there are obvious advantages of going straight back, more cash, more sellable Club and we then get rid of Mr Short. But until we see what a dogs dinner we are left with for this season I would settle for survival this season above all else.